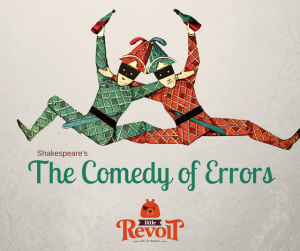 Little Revolt is very excited to begin a new Shakespeare adventure, working with students at a local school on our next project, The Comedy of Errors, adapted from the play by William Shakespeare. Thus, a group of eight graders soon will begin working on their very first Shakepeare show. We love doing theater with young people and presenting Shakespeare to them in a positive way. Sure, we get it. Some people find Shakespeare boring. His language can challenge both kids and adults. However, at Little Revolt we elevate a different side of Shakespeare. We emphasize that he was an imperfect person who was focused on making theater and earning a living. He wanted to entertain audiences, sell tickets, make people laugh, and create thrills on stage. Plus, he had great command of early modern English. 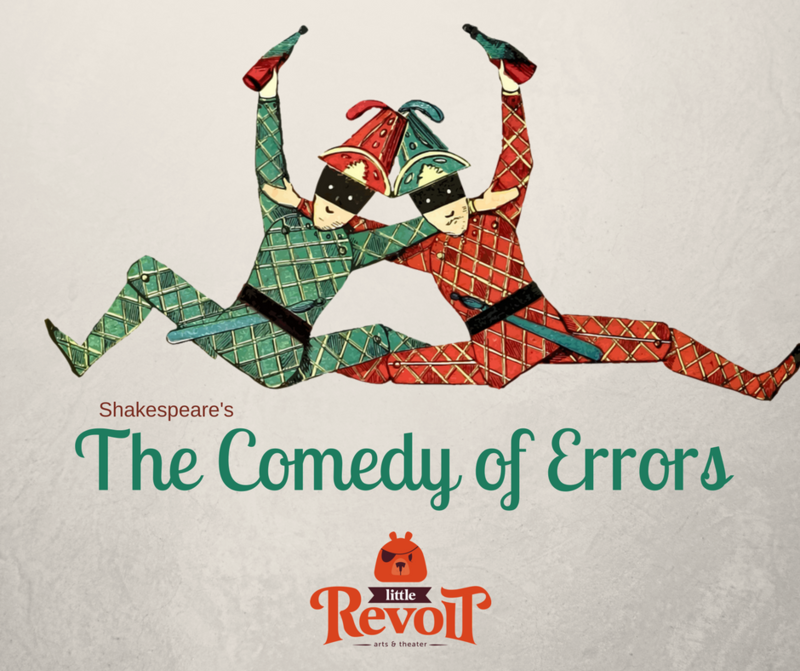 We aim to teach our students ways that The Comedy of Errors was performed originally. History tells us that the play was first staged in The Hall at Gray’s Inn in London, England in December of 1594. That makes it one of Shakespeare’s earliest plays. It is also one of his shortest. Little Revolt will borrow from early Elizabethan theater practices for our production. These practices include universal lighting, and so our audience will not be in the dark. In addition we will offer gallant stools, which provide special up-close seating for some guests (an idea borrowed from the Blackfriar’s Theater). And finally, we will have lots of audience interaction (which just makes things more fun). We have started working on the show. Our fabulous costume designer, Miss Dee, is making hats, and we are finalizing our script adaptation. The play as written by Shakespeare is wonderfully funny. I like to think of it as a masterpiece of comedy writing. Consequently, we will work with the students to find as much humor as possible. The Comedy of Errors promises to be a great time. Most of all, we look forward to introducing our students (and their families) to an exciting world of Shakespeare. Join our email list here or follow us on social media for future updates. It is fitting on today, April 23, the day when we recognize the birthday of William Shakespeare, that we launch this blog. It is also fitting on today that we announce: Registration is now open for Little Revolt’s teen summer Shakespeare Camp! First, about the blog. 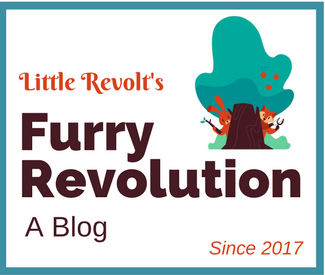 We have called our new blog ‘Furry Revolution’ because: a.) It’s cute, and b.) It reinforces the idea started with Little Revolt that we can — in our own small (cuddly) way – help make the world a better place by creating theater and art. I will spare you any pronouncements about what this blog will be. We will see. But I expect there will be news and updates about Little Revolt, along with ruminations about the trials and terrors of running a small nonprofit theater organization, as well as thoughts about the arts world in general. We invite you to check back occasionally, sign-up for email updates, or follow us on social media to stay in touch with us. Now, on to Shakespeare Camp. Little Revolt’s Summer Shakespeare Camp for teens (ages 13-17) is scheduled for July 27 through August 11. It will be held at the beautiful and historic Curtiss Mansion in Miami Springs, Florida. Shakes Camp will be a twelve-day fun and immersive experience. Planned activities include: learning Shakespeare original staging practices, costuming, talk-back sessions with adult actors, acting exercises, improvisation, movement, safe stage combat, Elizabethan era dance lessons, and more. Camp will culminate in a final student performance on the evening of August 11. Shakespeare Camp promises to be an intense, fun, busy, creative, and joyful 12 days. Our aim is to create memories which will last a lifetime. 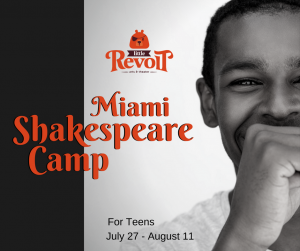 So if you’re a teen, or know someone who is a teen, register now for Little Revolt’s Shakespeare Camp. That’s it for our first blog post. Oh, and happy birthday, Shakespeare!